The Adesso Xtream G4 Virtual 7.1 Surround Sound Gaming Headset with Vibration takes your gaming experience to a whole new level with its built-in vibration and virtual 7.1 surround sound system. The built-in vibration system combined with the virtual 7.1 surround sound provide a different hearing sensation whether you are in-game or simply just enjoying your daily playlist. The audio driver further allows you to have different settings specifically to your own preferences. Along with the ergonomic design where the headband and earcup cushion are made with breathable materials, the microphone itself is also rotatable and delivers your in-game messages with clarity to your teammates. Last but not least, the LED lightings on both sides of the earcups offers a cool and stylish look for your ultimate gaming experience! The Xtream G4 offers virtual 7.1 surround sound system through its audio driver. This virtual system mimics the audio effect of a multi-speaker system set up by using different algorithms and simulations through its driver. Audio equalizer driver offers different customizations for your headset and allows you to customize your headset to play treble, middle, and bass sounds at your favorite decibel levels. The earcups and headband are adjustable to ensure the perfect fit, while the custom padding provides a soft comfortable cushion. The built-in microphone is omnidirectional which picks up sound with reliability and is flexible which allows you to adjust the position for optimal performance. The built-in noise cancelling technology helps filtering out unwanted noises from the background, delivering your voice in the most clear and precise manner. The control console provides quick access to some of the frequently used settings such as muting your microphone/- headset and controlling the headset volume. 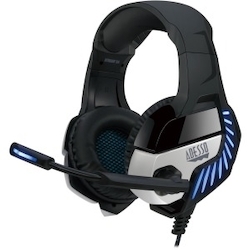 The LED lighting design provides a unique look and aura to the overall design of the headset.